Although we have had snow cover in Grand Marais since early December, the total snow fall amount is much less than in previous years. We’ve only had one big storm, which occurred around Christmas time. In January, we have only received a few inches of snow. There is still a lot of winter left; we will have to see what Mother Nature has in store for us. The first couple of photos were taken while on a very adventurous bushwhacking cross country ski trip in the school forest with friends Andy and Craig. I learned the hard way that it is not easy to ski in deep snow when you have skies meant for track skiing. After three falls and much effort, it was nice to see the Lake Superior beach from the vantage point east of town. The wind was definitely whipping off the lake, so we didn’t hang out at the bluff very long. Notice the beginning of the ice build up, as well as the floating ice balls, waiting their turn to accumulate and become part of the rows of ice that hug the shore. I skied back to H58 on the snowmobile tracks, rather than bushwhacking. The second photo was taken on the trail next to the Sucker River. A week or so after that I decided that I needed to get off my writing chair and go down to the beach; the wind had finally diminished after a couple of weeks of blowing, so museum assistant, Candace, and I snowshoed from the boardwalk in town down the beach to Sable Falls, and back. You can see from the first photo that the ice was piled on shore around ten or fifteen feet high. This shot was taken from in front of Woodland Park looking west. The next shot was taken of a teepee built on the beach by pre-winter tourists. They certainly had some time put into that project! Is anyone ready to move in? The third picture is Sable Falls. 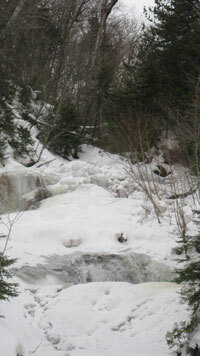 Yes, the waterfalls is hidden somewhere under all that ice. The third week of January I went out of town with friend, Dianna. It was a beautiful sunny day that drew us outside. In the winter, because of lake effect snow and clouds, we don’t have much of an opportunity to see the sun. We celebrated by skiing Canada Lakes in Newberry as well as Tahquamenon Falls, located north of Newberry. Below is a picture of Tahquamenon Falls, as well as a close up of some of the ice hanging from the cliffs next to the falls. 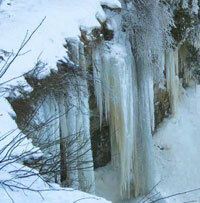 The icicles in the latter picture are 70 or 80 feet long!